I needed a haircut badly. So, as I do every other week, I took a visit to my barber, Tee, at Presidential Suites on the corner of Gratiot and Chene near Detroit’s Historic Eastern Market. Along the way, you have to pass Louisiana Creole Gumbo, which claims to serve ‘Detroit’s very best gumbo.’ To the right of the building is a colorful and powerful mural titled, ‘Detroit Never Left,’ created by artist Tashif ‘Sheefy’ Turner. The term ‘Detroit Never Left’ is actually trademarked by local haute couture streetwear lifestyle brand David Vintage. The City of Detroit is more than just automobiles, Motown, and the Renaissance Center, dominating the city’s skyline, overlooking the Detroit River. Detroit is jitting – a popular dance created in the city decades ago – flashy Cartier sunglasses, Detroit Tigers baseball caps, and bankrolls. All which Sheefy illustrated in his painting. Sheefy concocted the mural through Murals in the Market. In its fourth year, the street art festival is curated by Detroit art publisher 1xRUN and has produced more than 125 murals in the Eastern Market District from artists all over the world. Sheefy has two of his own. When people speak of Detroit in 2018, they speak of a resurgence. But that comeback talk often starts and ends with downtown, midtown, and white flight back into the city. The Detroit Never Left mural is the complete opposite. It is black Detroit culture, both young and old, created by self-proclaimed Detroit legend. Since the mural was completed in late September, it has been welcomed with open arms by Detroiters. It was one of the more talked about topics on social media in Detroit and has close to 1,000 likes on Sheefy’s Instagram page. Anyone in the area, whether heading downtown, to Eastern Market, or cruising the neighborhood can see its bright colors along Gratiot Avenue. 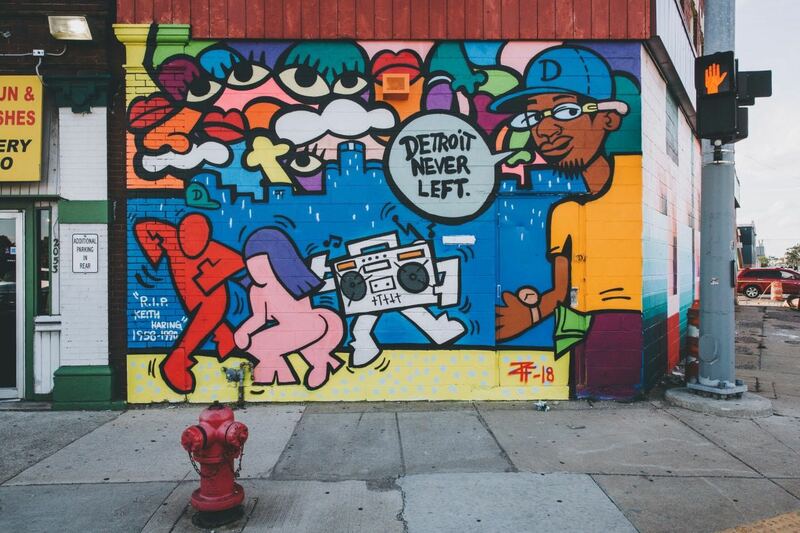 The Detroit Never Left mural is located on the corner of Gratiot and St. Aubin.